Pre-release 8x10 publicity photograph shows what Winifred Westover, the ex-Mrs. William S. Hart, went through to make her short-lived screen comeback in Herbert Brenon's 1930 adaptation of the 1923 Fannie Hurst novel, "Lummox." She had to gain 40 pounds and carry around even more weight to portray a frumpy and luckless family servant who was given her unfortunate moniker by a mean kid whom she tried to help. What price screen realism? 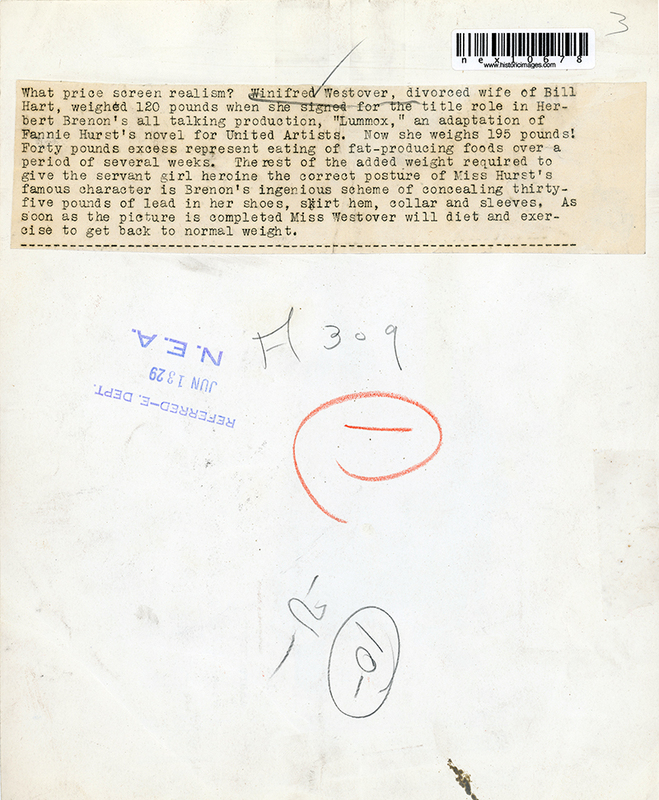 Winifred Westover, divorced wife of Bill Hart, weighed 120 pounds when she signed for the title role in Herbert Brenon's all talking production, "Lummox," an adaptation of Fannie Hurst's novel for United Artists. Now she weighs 195 pounds! Forty pounds excess represent eating of fat-producing foods over a period of several weeks. 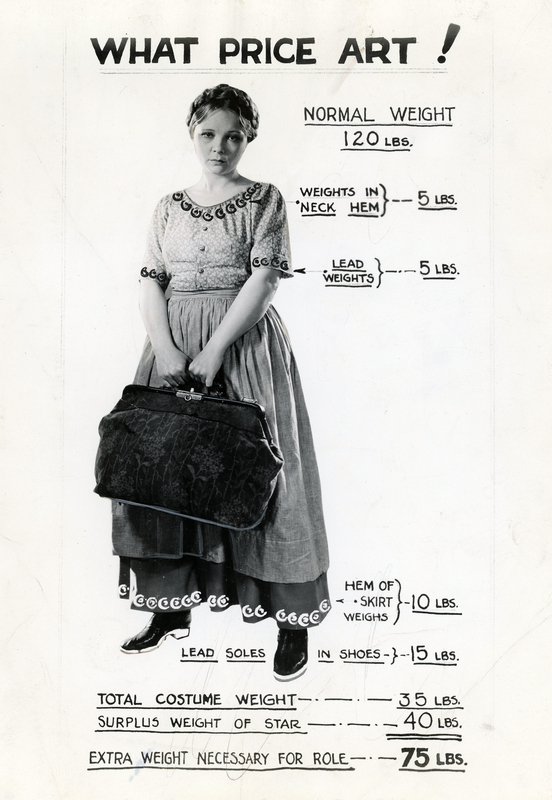 The rest of the added weight required to give the servant girl heroine the correct posture of Miss Hurst's famous character is Brenon's ingenious scheme of concealing thirty-five pounds of lead in her shows, skirt hem, collar and sleeves. As soon as the picture is completed Miss Westover will diet and exercise to get back to normal weight. Miss Westover has a placid face and her fair hair is coiled on the top of her head for this rôle. As [the character] Bertha she is sluggish in her movements and her only sign of satisfaction is a half-hearted smile. As the years roll by, Bertha becomes even slower in her actions and not until the end does she really look cheerful. Her message of spiritual goodness fails, that is until she comes to the last few scenes. It is for the most part a lethargic pictorial story with several unconvincing episodes, but the stellar player, Winifred Westover, former wife of William S. Hart, the two-gun man of silent films, commands serious attention through the sincerity of her portrayal of Lummox, the Swedish drudge, whose life is a series of bitter disappointments with selfish, thoughtless, unkind and unfair employers. With the exception of Miss Westover's careful and commendable impersonation, however, the characters are more often than not like puppets at the beck and call of the director, an impression which is strengthened by the halting and recitative delivery of their lines. LW2868: 9600 dpi jpeg from original photograph purchased 2017 by Leon Worden.